Media: Soft, glossy, colour covers; 21.5cm x 28cm portrait format, printed in black and white on 112 good quality pages. Ten pages of colour artwork by Richard J Caruana plus many black and white, as well as colour, photographs. Advantages: Good examination of a much-modified and upgraded aircraft; fine selection of photographs, many never published before; colour profiles by Richard J Caruana. Published in 2005, 'Shackleton - Guardian of the Sea Lanes' is the first volume in Dalrymple & Verdun's new series of '...detailed and well illustrated accounts of classic aircraft in service from prototype, to the few remaining preserved examples'. Presented at just under A4 size, the book has soft, glossy covers with distinctive cover artwork in a 'Pop Art' style, whilst the two-columns-per-page text is printed on semi-gloss/satin pages. Complimenting the text are some 160, mostly black and white, photographs derived from a wide range of sources, many previously unpublished, showing the Shackleton in its many marks and variants. There is a slight bias towards Maltese subjects within these images, since two of the major contributors are Godfrey Mangion and Richard J Caruana, but the book is non the worse for that. The detailed text follows the development of the Shackleton from its Lancaster-inspired inception, through changing service roles, modifications, upgrades and then onwards to eventual retirement and replacement. Helping to complete the story, there are several technical line drawings provided, illustrating features of the aircraft's construction. Useful for the modeller, there are 10 pages containing over 35 colour side profiles and 4-view illustrations by Richard J Caruana, covering the aircraft in squadron service (grouped by version), and as a trials aircraft and even as a target tug. The story of the Shackleton is covered by the book in eight chapters. 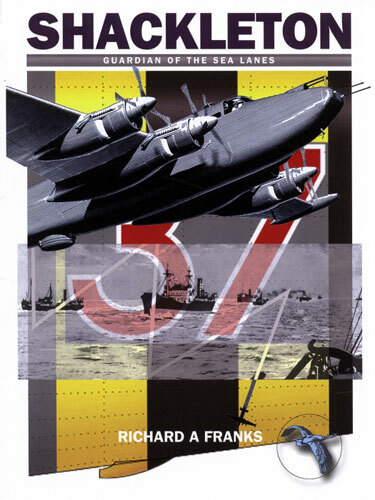 Chapter one describes the creation of Coastal Command as a separate entity, with the remaining chapters describing: the prototype and Mk.1 development ('A Legend From a Legend'); the Mk.2 and trials work ('Improving the Type'), the Mk.3 and adoption by the South African Air Force ('Third Time Lucky! '); the T Mk.4 trainer variant, test work and 'police duties' ('Training, Peace Keeping and Atomic Tests'); then tackling the somewhat complicated Shackleton upgrading and improvement story ('Continual Upgrade and Service'); the AEW Mk.2 stopgap solution, ('The Projects', 'The Interim Solution' and 'The Folly') and finally; detailed information on paint schemes and markings ('Shackleton Colours'), including the aforementioned colour profiles. There are also four appendices: 'Technical Data' on the Mk's 1 to 3, AEW Mk.2 and the T Mk's 2 and 4 (includes the technical line drawings); 'Shackleton Squadrons', including those used in Government research and testing as well as foreign service; 'Shackleton Production', a full list of airframes, with notes on each serial's squadron allocation(s), etc. and finally; a listing and details of aircraft tested by the A&AEE at Boscombe Down. 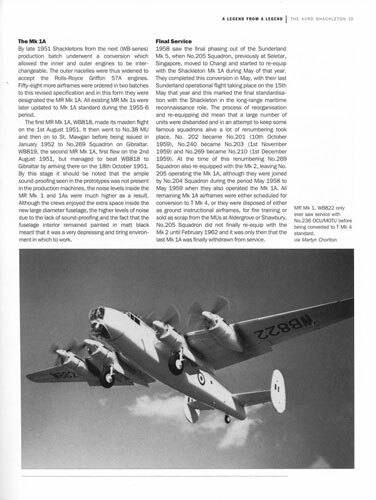 The book concludes with a two-page description of the failed attempt to return an ex-SAAF Shackleton to the UK in July 1994 ('Pelican 16 – Last Flight of the Shackleton'), a Glossary & Bibliography page, an Index page and finally a few evocative photographs of scrapped or dumped airframes. From a modellers perspective, this book certainly provides inspiration, if that were needed, to tackle one of Avro's swansong 'heavies', though some more detailed 'walk around' photographs would have been useful. Equally, although not exhaustive, the text competently portrays the life of the 'Shack' and skilfully guides the reader through the somewhat convoluted development, modification and upgrading it experienced. Mister Caruana's profiles are the 'icing on the cake' and will be especially helpful regarding the perhaps less well known early variants. Sadly, the Shackleton has become somewhat of a 'forgotten warrior', having put in many years of service undertaking a variety of (perhaps) unglamorous roles. Although published in 2005, this review is written in 2007 - 50 years since the first unit to re-equip with the the, then, new MR Mk.3 received their aircraft (No.220 Squadron at RAF St Mawgan, on 30 August 1957) - and as such, this book provides a timely reminder of a much-loved and respected machine.